Well we are closing in on the end of Sale-A-Bration! It has been a great opportunity for savings. I wanted to remind everyone of the best bundle yet and that is the demonstrator sign up starter kit. You get $125.00 worth of product for $99.00 and no shipping cost. 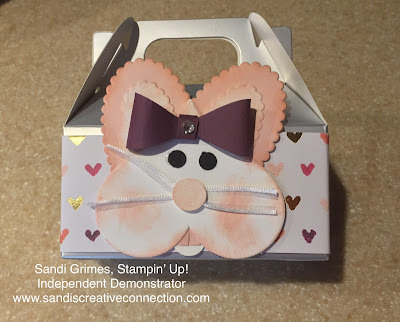 During Sale-A-Bration, Stampin’ Up! sweetens the deal with your choice of two more stamp sets from either catalog. All of your orders after are 20% off. You still get to come to class and hang out with the creative gang. You don’t have to sell or have classes, you can be what is called a hobbyist. This is the best opportunity all year! CLICK HERE for a Q&A PDF which I believe with answer most of your question. If you think this is something you would like to do, call me immediately because time is running out. March 31st. is the last day. Wishing you a blessed day & Happy Stamping! This is a fun Easter Project! I have made it two ways. One with a Stampin' Up! gable box that I had in stock at my studio. But then I decided to do a DIY box so that you could do this at home. Easter is only a few days away. CLICK HERE if you would like to see the video of how I put this together. I have also provide a recipe below. Hope you get a change to do some crafting today!